Blog Feature: You may not be aging your Rhone whites. But if you do, here's what to expect. We know that shipping wine can add up, and we want to make it easier for you to enjoy our wines. So any order you place from now until the end of April, from a bottle of wine to two cases or more, will be shipped anywhere we ship for just $10! The more you order, the more you save, so use the opportunity to send wine to yourself, your family or your friends. And, as always, any order that includes six or more bottles of our Esprit de Tablas or Esprit de Tablas Blanc wines has shipping included. The discounted shipping is applied automatically on our online order form. "A key region for wine production on the stretch of land between San Francisco and Los Angeles known as the Central Coast is Paso Robles, with 200-plus wineries draped across more than 650,000 acres and centered around the city that shares its name. Since its inception in 1989, Tablas Creek has led the charge for top-quality Rhône-style wines in California." San Francisco Chronicle: "Tablas Creek, Key Winery for America's Rhone Movement"
"The Tablas Creek story is well told, but the importance of this vineyard and winery for the state of America’s Rhone wine movement cannot be overstated. As you might expect from such a focused, generational, global project, the tasting room is really a place for education about all aspects of wine." "While the wine business has always been challenging, new generations of winemakers face new sets of challenges their parents and older winemaking relatives didn’t have to contend with--things like how to stay relevant using social media, effects of climate change, and connectivity with modern consumers who have higher expectations and don’t necessarily choose wine by regional or brand reputation alone. Are sweeping changes at the house always necessary, or can next generation winemakers take on the business with simple tweaks? Here are six winemakers who’ve continued a family legacy, and how they operate in a very different modern world." Combines structure with polish and substance, offering expressive raspberry, garrigue and smoked spice flavors that build richness toward refined tannins. Mourvèdre, Grenache, Syrah and Counoise. Drink now through 2025. —T.F." We are always proud to have one of our wines appear in a year-end "Top 100" list, and to have our 2015 Esprit de Tablas (94 points) represent Paso Robles at #50. Thank you to Owen Bargreen and his Washington Wine Blog! We were excited to read Jeb Dunnuck's annual reviews of our wines, focusing on the 2016 and 2017 vintages. 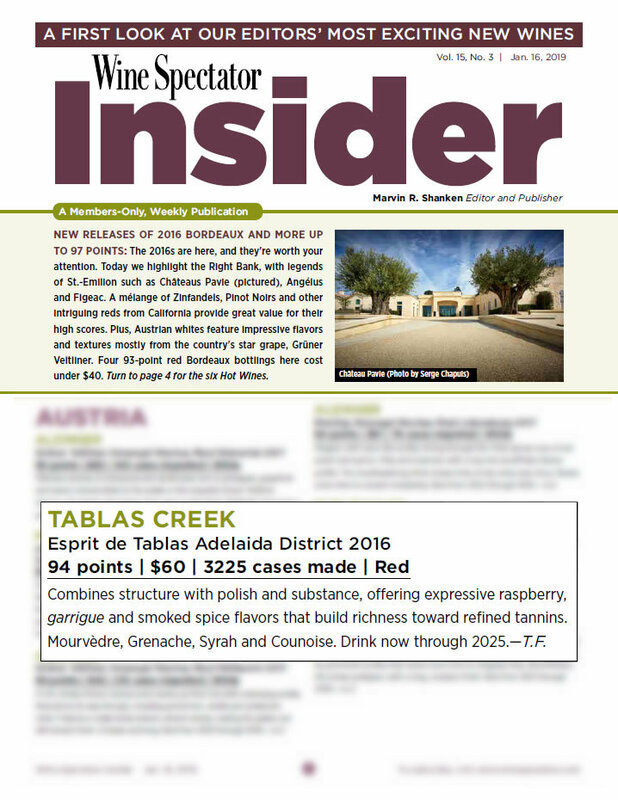 23 wines received 90+ points, and he notes that Tablas Creek makes "beautiful wine[s] that age incredibly well". Highlights from current releases included the 2016 Esprit de Tablas (93 points), 2016 Esprit de Tablas Blanc (93 points), and 2015 Panoplie (95 points). Upcoming releases included 2017 Mourvedre (91-94 points), 2017 Esprit de Tablas (93-95 points), and 2016 Panoplie (96 points). We have compiled Jeb's Tablas Creek reviews together here. You can read his extended commentary on Paso Robles at JebDunnuck.com. To receive our quarterly newsletters, and a note when we're coming to town, join our mailing list. We will never share your information. You can also read our Harvest Journal or browse an archive of our newsletters. For the newest updates, visit the award-winning Tablas Creek Blog! Join us! We are busy locally and around the country with seminars, tastings and wine dinners. Read about all of these on our upcoming events page.